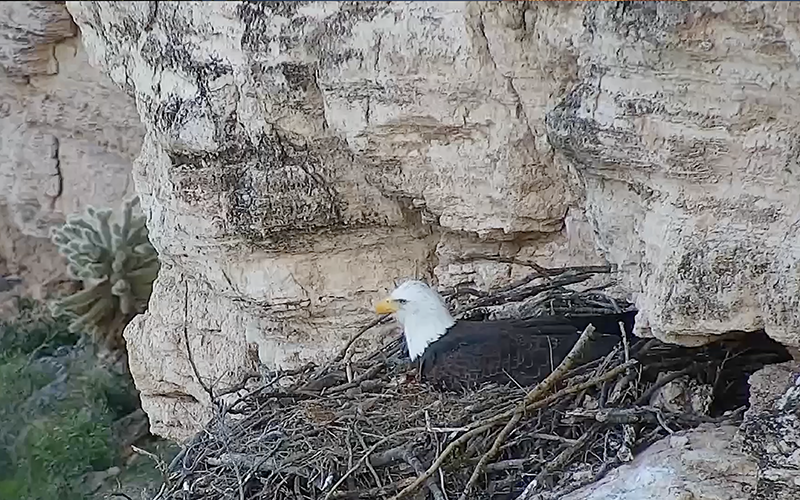 LAKE PLEASANT – Bald eagles are nesting at Lake Pleasant north of Phoenix, and thanks to the Arizona Game & Fish Department, you can observe one pair of parents-to-be through a live webcam. Thousands of people watched last month when a pair of ravens swooped in while the parents were away and ate the only egg in the snaggled nest, which is perched on a rocky ledge. The good news is, the female eagle laid another egg soon after. “Viewers are repeatedly drawn into the daily drama of survival,” Jeff Meyers, who coordinates Game & Fish’s watchable wildlife program, said in a press release. The camera went up before breeding season started in November and started live streaming footage in December. It’s one of four seasonal wildlife cameras around Arizona – the others watch sandhill cranes, bats and pupfish. Last year was a “banner year” for the eagles, according to Kenneth Jacobson, raptor management coordinator for the department. Eighty-seven eggs hatched and 70 bald eagles successfully fledged last year, a record for both categories. “Now we’re at the very start of the 2019 season and hope to continue to see that growth,” Jacobson said. The bald eagle was on the brink of extinction in 1978 when the federal government listed it as an endangered species in most of the country. The pesticide DDT and lead poisoning from ammunition were two of the largest reasons. Today, there are an estimated 69 breeding pairs in Arizona, according to Game & Fish, and a record 87 breeding sites. The bald eagle’s recovery in Arizona came from a 40-year effort through a national nest-watch program with intensive monitoring and protection of the bald eagle sites. The birds were taken off the endangered species list in 2007, but Arizona continued protecting bald eagles until 2011. This story is part of Elemental: Covering Sustainability, a new multimedia collaboration between Cronkite News, Arizona PBS, KJZZ, KPCC, Rocky Mountain PBS and PBS SoCal.